For centuries man has been asking what constitutes the soul, where does it reside, and where does it go upon death? The Ancient Egyptians believed that the Seat of the Human Soul resided in man’s Heart. Because of this belief, the heart was the only organ preserved, in all its purity, inside the mummified body. The rest of the organs, brain, guts, intestines, etc. were removed and preserved in canopic jars, should they be needed again in the afterlife. Mummification and viscera preservation was not a standard practice for everyone during ancient times. Only the wealthy could afford such a complex and laborious process, which was usually the case with kings, pharaohs, royal families, and high officials and noblemen. 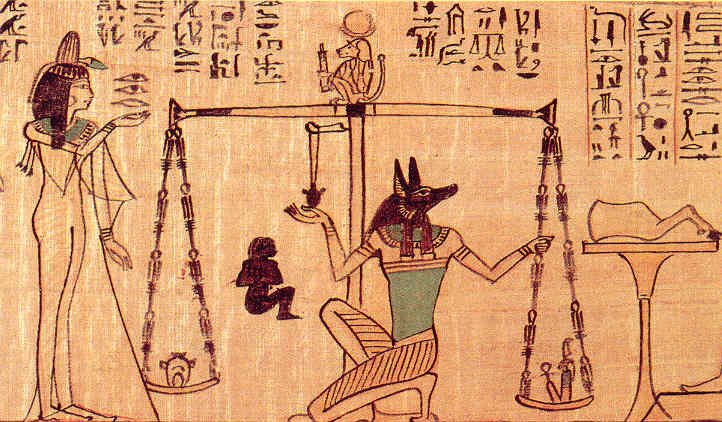 According to The Egyptian Book of the Dead, a soul was judged by the “Feather of Truth” in the “Weighing of the Soul” ritual. The ‘heart’ of the Soul was handed over to Anubis, the god of the afterlife, who placed it on a great golden scale balanced against the white feather of Ma’at (the goddess of harmony, justice and truth), on the other side. If the soul’s heart was lighter than the feather due to good works, then the soul was freely admitted into the bliss of the Field of Reeds, a heavenly paradise. Should the heart prove heavier, due to leading a bad life, it was thrown to the floor of the Hall of Truth where it was devoured by Amenti (a god with the face of a crocodile, front of a leopard and the back of a rhinoceros) and the individual soul then ceased to exist. There was no `hell’ for the Ancient Egyptians; their `fate worse than death’ was non-existence. Lightness of heart and soul meant the person had led a life of love, compassion, good works, and spiritual attunement. Sometimes the wealthy would cheat a little, hoping to rack up brownie points for judgment day, by paying others to do good works for them. Even back then, man looked for ways to beat the system or, in this case, the gods. The Egyptian’s concept of the soul isn’t much different from what we accept today. The soul is that part of you that existed before you were born and that will exist after you die. It connects you to the God Source. It embodies all that you’ve learned in the past and will carry with you into the future. In other words, the soul is the great “I Am” that inhabits the body and acts through it. Without the soul, the body is like a light bulb without electricity, a computer without software. Through the soul the body acquires life, sight and hearing, thought and speech, intelligence and emotions, will and desire, personality and identity. 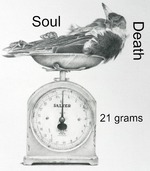 They say the soul weighs 21 grams, but this is urban myth born of faulty science. In 1901 a physician named Duncan MacDougall conducted some experiments on six elderly patients dying of tuberculosis. He assumed that if souls exist, they must have material weight and by measuring a body before and after death one could calculate what a soul weighs. His results varied widely. Four of the six patients lost weight after death, one lost weight immediately, another continued to lose weight for a prolonged period, and still another lost weight, then gained weight, then lost weight again. MacDougall measured a loss of 21.3 grams in the first patient monitored, which is the figure he stuck with despite the other patients’ weight variations. Pretty deplorable science by today’s standards. MacDougall published the results six years later in the Journal of the American Society for Psychical Research. News of the experiment was published by the New York Times in the March of 1907, spreading MacDougall’s ideas and results even further into the mind of the general public. What MacDougall failed to take into consideration was that the body loses weight after death for many common reasons, none having to do with the anatomy of the soul. A dead body has the unpleasant tendency to leak fluids when the muscles relax. The bowels evacuate, the body may bloat due to decomposition, and the cells in our body, which contain enzymes, start producing gases. All this happens upon death and varies for each individual, causing weight differences. The soul cannot be weighed. The soul is intangible and does not have mass. But since everything is energy, and the soul has energy, what can be measured—especially at the moment of death? If anyone has been witness to either a birth or death, the energy felt can be quite profound. I had a rather strange conversation with a cardiac surgeon one day about his experiences during heart transplant operations. He told me that he often felt a profound depletion of life force energy drain out of his own physical body whenever he removed a heart from a donor heart person. However, when he held the same heart in his hands and transplanted it into a heart recipient, he would feel an electrical charge go through his body. He said it made him feel “very alive.” I’m not sure where to classify this conversation, but it stuck in my mind. I wonder if other cardiac surgeons have experienced a similar experience? If the soul resides in the heart of the living being and the body dies, and the heart is transplanted, many might ask if the soul is also “transplanted”? The Ancient Egyptians believed the heart of a person should never be separated from its owner, which is one reason they carefully preserved it inside the mummified body. Of course, back then they didn’t have heart transplant capability either, so the idea of a donor heart benefiting another human being never came into question. What we can hopefully agree on is that the soul is immortal. It does not end when the human body ceases to exist. It may actually reside interdimensionally within each of us, which is why it has no mass or weight in this physical dimension. I have heard some near-death experiencers talk about actually seeing the soul on “the other side” and it is pure light. Our visual spectrum on this plane cannot view it. This is where we might get into the infinite realm of quantum physics and Planck’s scale of energy to better understand the dimensions, but that’s for another blog. While we spend millenniums searching for answers to the Soul, they too, like everything else, can probably be found deep within each of us waiting to be re-discovered. It’s usually always hidden in plain sight. I think God must be chuckling. Thank you for your detailed article about this mystery.